Notes: Located at East Jefferson and Drexel Avenues. I have a photo of my parents pushing me and my twin sister pass the time thearter on jefferson in detroit. 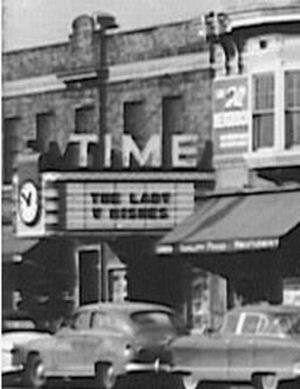 There were 3 movie theaters there on East Jefferson, all just a block or so apart- 4 if you count the Esquire which was just over the city line in Grosse Pointe- Time (9 cents). Cinderella (20 cents) and Lakewood (12 cents). I don't know what the admission was for the Esquire but, as a kid, we never went there. I remember when Superman himself made a personal appearance at the Cinderella and amazed us all with his feats of strength. Ahh. the fond memories the Time Theater rekindles in my mind, where Rex and Roy and Gene and Durango and Rocky rode the range. Plus. the Bowery Boys, Abbott & Costello, the East Side Kids, Tarzan. and so many more classic B entries. It was a different era, where, as a mere 10-year old, I could walk 14 blocks - - -alone - - - to see 3 of these classics on Saturday afternoon. before that dreaded price-increase. to 11 cents!. Just happened to bump into your page and noticed that the Time theater is not listed under Wayne County. Back in the middle 50's, as a kid, if I walked a block past the Cinderella Theatre on E. Jefferson I could get into the Time Theatre for 9 cents (that's right 9 cents).